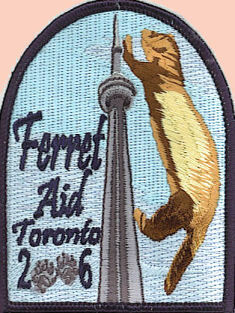 This is a patch for shelters and supporters to show their love of ferrets. This patch features Tess whose photo was entered in the Ferrets of the FML Calendar Photo contest. These are a little larger at a size of 3.5" round, 100% embroidered, iron or sew on and washable. $5.00 each per patch, [including postage], additional shelter patches $4.50 each. Buy one for yourself and your favorite shelter mom or dad and help SOS support ferret shelters. 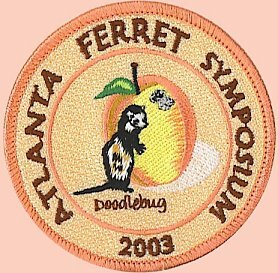 2011 International Ferret Symposium and features Cecil Cruse, Ferrets of the FML Calendar kid. Each Phoenix patch is larger at 3 1/2" round, is 100% embroidered, iron or sew on, and fully washable. They will look great on your favorite wearables. $5.00 each per patch, [includes shipping], additional Phoenix patches $4.00 each. Commemorates 'Pittsburgh Ferret Symposium' held November 2008 in Pittsburgh, PA. Features Blizzard Sonder, an FML Calendar kid, and Point State Park Fountain. 100% embroidered, iron or sew on, and fully washable. Size is 2 1/2" x 3 1/2"
Any number of additional IFC event patches, can be ordered for $4.00 per patch, mix or match. These patches are wonderful ferret collectibles. Your denim tote, jacket, shirt or other items will look great with one of each patch. Commemorates 'Portland Ferret Symposium' held June 2007 in Portland and features Cassie Iroff and Mount Hood. Size is 2 1/2" x 3 1/4"
Collect all the IFC event patches. Don't forget your purchases help ferret shelters on the SOS shelter List. Commemorates 'Ferret Aid 2006' which was held June 2006 in Toronto and features Pong Stout and the CN Tower. $4.85 for the first patch, [includes shipping], $4.00 each for additional patches, mix or match. Order your patch now if you didn't pick one up at the Toronto event! 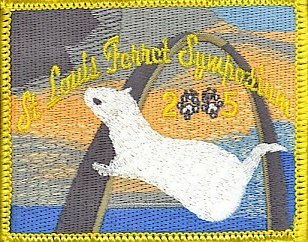 2005 International Ferret Symposium and features Stormy Bearden and the St Louis Arch. Each patch is 3 1/2" x 2 3/4", 100% embroidered, is iron or sew on, and fully washable. They will look great on your favorite wearables. to get one of these great highly collectible and very wearable patches. These are 3" - 100% embroidered patches are iron or sew on. and Patches in the subject line!